That looks amazing. Love the shot of Bogey QT. I think that scoring is overrated (mostly because it is not my strong suit) and the proof is in the flavor of the bread. P.S. That’s what I hate about golf. The worse you do, the longer it takes, unlike tennis. If you stink, it ends quickly and mercifully. It looks so good!!!! I love all of the seeds and your slashing looks perfect 👌🏻 but yes, I know what you mean, you only get one go at it! Thank you ! Awesome bread and crumb looks “yummy”. You handle a 4-iron? Well, I don’t even HAVE it in my bag because there is no way I could master it. EVAH! No, the 5-iron already gives me enough trouble. NOw the woods are interesting. I have a 5 wood and a 7 wood – I call them Tale of Two Cities – it was the best of shots, it was the worst of shots.. I simply never know which will be. Great looking bread. Glad the supervision paid off. Did he get a bite or two? 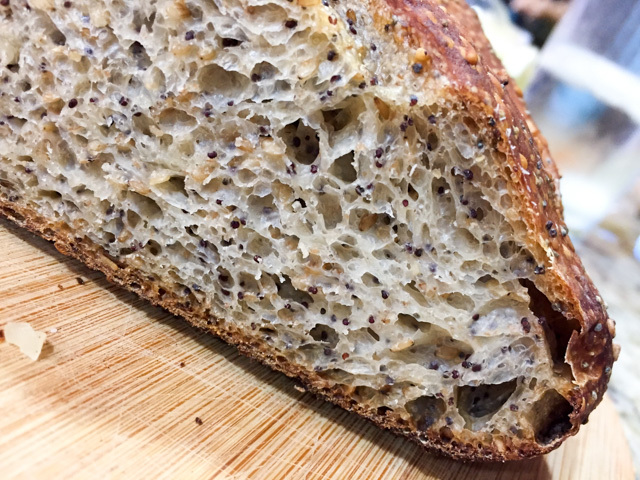 That’s a beautiful crumb. Yes, the slashing always induces a “moment”: can be quite hard to get into the mindset of just going for it! Just thinking about that bread with good melty brie makes my heart sing. Did the Bogester get any?? Of course you should use a very sharp blade for the slash since dough is going to resist. But why not practice first? Take the pressure off. Plop the blob on the board and just have it. Slash slash slash. I think the trick is in the wrist to get a nice curve on the slash. Then when you’ve massacred the dough, turn it over, knead it back into a blob and slash away again. In this way, you’ve had a lot of practice before you take the risen dough out and do the final slashing. It’s like any great skill. You want to warm up and practice before you go on stage. The bread is beautiful. I’ve been a baking fool of late as well, baking all of the bread being consumed at this house. 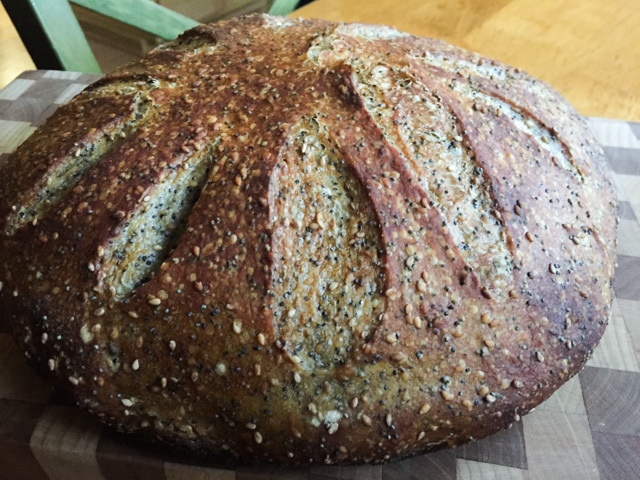 I love whole-grain German rye and it is so hard to find. I’m doing a lot of experimenting with all of the “no-knead” and “dutch oven” recipes. Still haven’t hit on “the one” but I will keep at it. 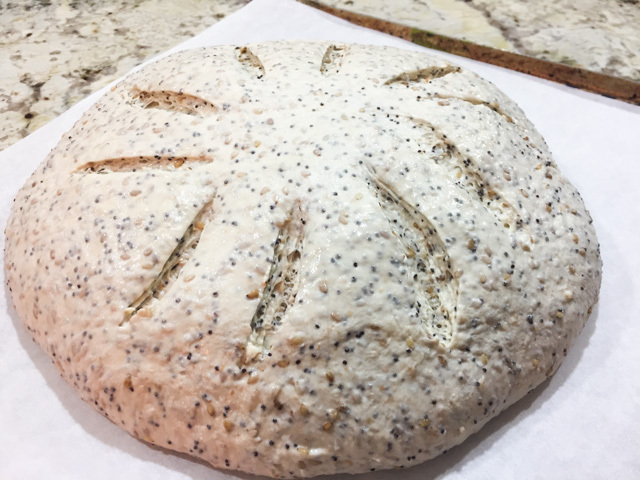 Trying this Poppy Seed and Sesame seed variation today – adding it to my ‘go-go’ Rosemary and dried Cranberry mix – will be interested to see how it turns out. Hummmmm…. I like your additions! 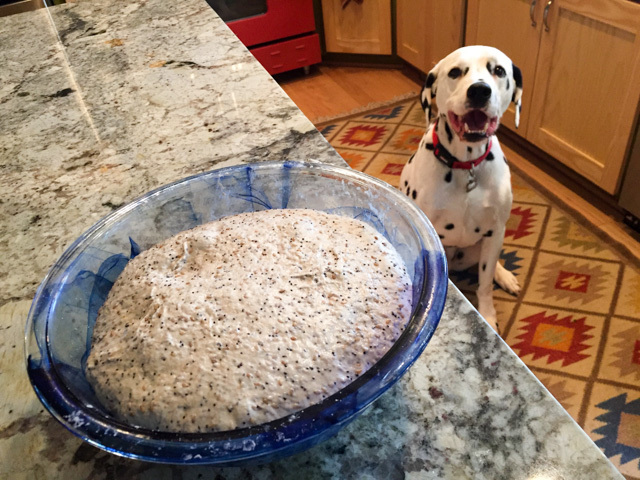 I hope it turns out wonderful… I am baking bread this weekend, but I think I’ll do a very simple white and rye sourdough….